The Body Toxic: How the Hazardous Chemistry of Everyday Things Threatens Our Health and Well-being is one of those books that freak me out…sometimes I just don’t want to know. In reality, we need to know about all of the chemicals of modern industry and how to protect our families. Knowing is the first step to making informed decisions, which is probably one reason you are a reader of Eco Child’s Play. This is a chilling look at the questionable safety of nearly everything we store food in, drink from, wear, walk on, rest on and drive. Chemicals used to make everything from water-repellant jackets and flame retardants to unbreakable plastics used for food storage are building up in our bodies and the environment with possible far-reaching consequences, says journalist Baker. She focuses on endocrine disruptors that alter hormone levels, even in fetuses. Individual chapters consider the weed killer atrazine; phthalates found in many cosmetics; and perfluorooctanoic acid, used in nonstick and stain-repellant coatings. Lab studies have linked these chemicals to cancer, diabetes, obesity and attention deficit/hyperactivity disorder, among other problems. Baker blasts both Democrats and Republicans in Congress for the toothless Toxic Substances Control Act of 1976, which leaves testing and reporting results to the manufacturer. But the companies rely on skilled public relations firms to attack scientists who raise safety concerns. The current pro-business administration also takes some licks from Baker. Although she offers suggestions for reducing exposure to these chemicals, No place—and no one—is immune. 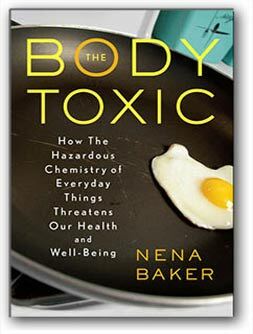 Author Nena Baker was motivated to write this book after her own body burden analysis revealed more than three dozen chemicals. I wonder what my body burden test would reveal? I am too afraid to find out! Yup, I know exactly what you mean here. We are trying to “de-chemicalize” our home too. Eversince I found out just how HORRIBLE non stick really is for you, and that it actually was the cause of thousands of pet birds dying when their owners cooked, and left hte pan on too long, I was wondering about what it was doing to my family too. We bought a bunch of WHITE LE CRE– USET pots…and yeah, they were heavy, and expensive, but I know it will not be harming us, and does a great job too! I think there are poisons in so many things, especially the water, so be sure to use a great water filter!!! And in soaps, so try to go for “natural” soaps, which you can find online usually or at Whole Foods types of places, not usually the supermarket. Hey! I love this site–have commented on a few things. I am reading “Slow Death by Rubber Duck” by RIck Smith and Bruce Lourie. They exposed themselves to various household chemicals (BPA, etc) and tested their blood levels to see what actually happens to our bodies. Quite interesting! It is a scary environment, we are unknowingly providing for our children in our own homes…we should all be a little more aware! thanks for sharing such great information! that’s very good to know! I agree, you gotta REALLY watch out for all the toxins out there. They can kill ya, literally. Great book, i will check it out. Buy organic produce too! Awesome website you have here but I was curious about if you knew of any community forums that cover the same topics talked about here? I’d really love to be a part of online community where I can get feedback from other experienced people that share the same interest. If you have any suggestions, please let me know. Bless you!